Aside from automated email messages and a dedicated Email add-on, Teachworks also offers a MailChimp integration. This integration allows you to seamlessly sync your Teachworks contacts to lists in MailChimp. An email subject line might seem insignificant, but think about it – we all get hundreds of emails each day and your email can easily get lost in the crowd. You need to craft a subject line that will persuade your clients to open your email. Finding subject lines that work well might require some testing, so you may want to run an A/B campaign to test our different subject line variations. Once you know more or less what works for your clients (pay special attention to open rates), this will become a much simpler task. Before you get started with your email, you may want to spend some time on figuring out what information will be included in the email. Each email message should have a clear purpose purpose and the content should be relevant. If you’re writing a newsletter for example, your email should be informative and should include information that has some significance for the reader. It can be easy to get carried away sometimes, but it’s important not to overwhelm your clients with too much information. Focus on the highlights and provide links to additional information. You can also include a call to action to allow them to contact you if they have any additional questions. With a clear plan of action on your side, you’ll be able to create a scannable email that offers the perfect mix of information. Even editors need editors. Make sure that you carefully read through your email before sending it to your clients. If you offer English courses at your tutoring centre and your emails are riddled with spelling errors, clients might lose trust in you. A fresh set of eyes is always a good idea, so why not send a test email to a couple of employees and ask their opinion on the contents. If anything is unclear or ambiguous, or if there are any spelling errors, they’ll be able to point it out in no time. Visually appealing emails that are easy to read generally perform better and will encourage your clients to continue reading. Steer clear of flashy design and big chunks of text and opt for simple design instead. Make it easy for your clients to see at a glance who the email is from by incorporating your branding in the email. A good way to achieve this is to add your logo in the header area of your email. If you have a small company with limited resources, don’t worry! 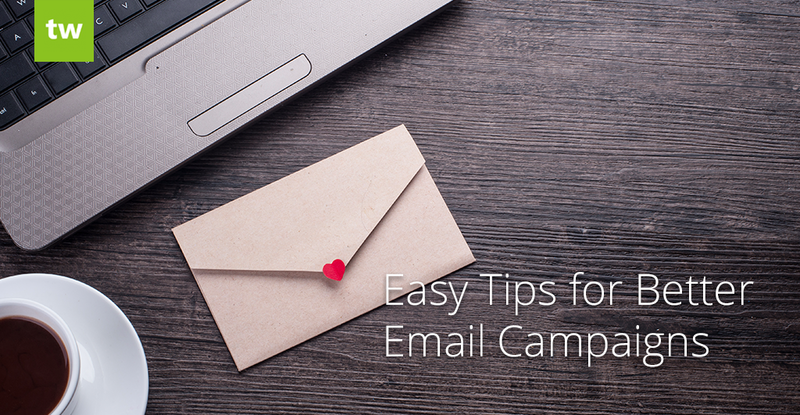 You don’t have to be a designer to create beautiful imagery for your emails. There are plenty of online tools that can help you simplify the design process. A good example is Canva – this online design tool allows you to create eye-catching email headers in minutes. It’s very likely that the majority of your clients will view your email on a mobile device, so it is crucial to make sure that your email will scale well and still be readable on mobile devices. MailChimp allows you to see a preview of what your email will look like on mobile, so be sure to check this before hitting send. If you’d like to try out our MailChimp feature, visit our knowledge base for more information.